Sporting a black shirt in front of a black background, it seemed as though his head had emerged from the ethernet itself. The NSA whistleblower who had disclosed thousands of secret internal documents from his former employer was conducting the Queen’s International Affairs Association (QIAA) keynote address via live video feed on Thursday evening. Titled “Surveillance After Snowden,” the discussion sought to answer how democratic societies should conceptualize and ultimately confront mass surveillance. Since 2013, Edward Snowden has been held up in Russia in an undisclosed location, first under political asylum, and now on temporary residence. Following his NSA disclosures, the US government allegedly revoked his passport while on his way to Latin America for permanent asylum. “When we look at the experience of sweeping legislation—particularly under the justification of terrorism—we have a clear and well established record that mass surveillance is not effective in thwarting terrorism,” he said. He argued that parts of the legislation would likely stifle legitimate political action. Referencing how progressive movements begin as a challenge to some status quo, Snowden explained that Bill C-51 is the ultimate sanction for anybody who engages in civil disobedience. The documents Snowden disclosed in June of 2013 detailed how programs such as XKEYSCORE had been utilized by the U.S. government to spy on peoples electronic communications. Court warrants had seldom been sought by the NSA in the use of such practices, and many legal experts and some federal courts have contended they violate the constitution. His relative freedom has enabled him to become a leading critic of mass surveillance and the growth of the national security state. Snowden appears frequently as a guest on current affairs television programs in addition to academic lectures, via webcam. 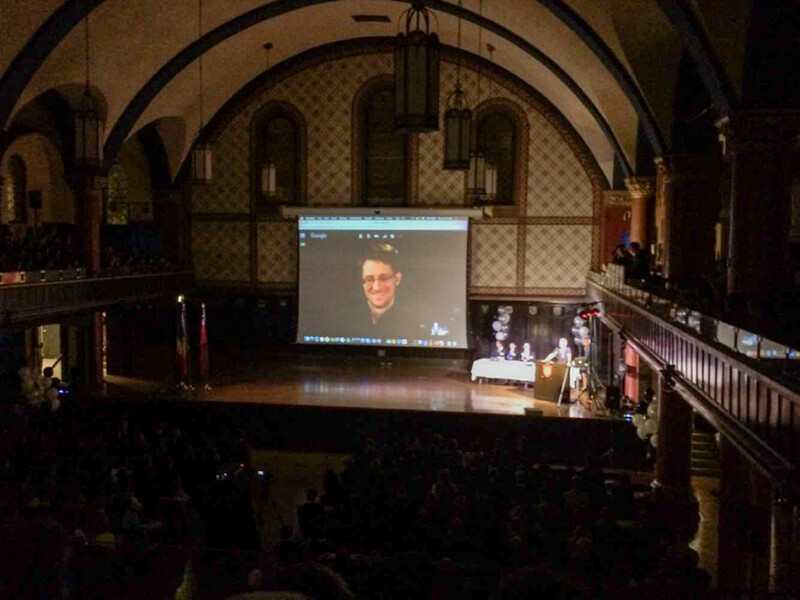 For his university audience last Thursday, Snowden critiqued the growth of an unprecedented system of electronic surveillance that he had helped construct, and outlined his motivations to become a whistleblower and leave the United States. Recalling how the moment he realized “the depth of dishonesty that was occurring” by the NSA, he felt his public duty to speak out about mass surveillance began to outweigh his faith in the effectiveness of the NSA’s spying programs. The notion of going public with the disclosures became a moral concern for him. “If you have the capability to change the outcome of the situation, you also have a responsibility to do so,” he said. For Snowden, the question of mass surveillance went beyond the alleged illegality of the programs and into a broader discussion concerning how informed the common citizen is. Despite the strong rebukes of the growth national security state in the U.S. and elsewhere, Snowden argued his disclosures had succeeded in altering the discourse and attitudes citizens and politicians held in regards to privacy and surveillance. He concluded by stating how he was ultimately content with his decision to go forward with the disclosures. “I would do it again, because I have gained so much more than I have lost,” he said. “The things I do today I can be proud of and if my life ends tomorrow I can be happy with the decision that I made.